Chopped leafy green salad with a tasty Greek dressing. Wash then pat dry a small head of leaf lettuce. Place a handful of lettuce on a cutting board and chop with a large knife, into bite size pieces then place in a salad bowl. Peel cucumber; slice in half then in half again from one end to the other. Remove the seeds. Cut tomato into bite size pieces. Peel the skin from the red onion and slice into thin rings or use a mandolin for uniformed slices. Place the cucumber, tomato on the chopped lettuce. Salt and pepper to taste then top with olives, crumbled cheese and red onion. 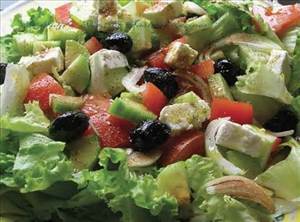 Drizzle the Greek dressing over the salad and enjoy. 43 members have added this recipe to their cookbook. A salad of arugula steak and red onion. A simple salad of 4 ingredients. Egg frittatas are always a delicious breakfast option. Creamy cucumber salad with blue cheese and dill. There are 384 calories in 1 serving of Chopped Greek Salad. Calorie break-down: 60% fat, 28% carbs, 12% protein.